Before arriving Vietnam we didn’t know exactly what to expect, even though many had anticipated us “You’ll see traffic in Vietnam!”, “Simply insane!” ” Mopeds are literally everywhere “. 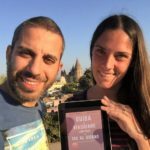 In three months we have driven on the roads from north to south and reach dozens of places, both in town and in the countryside, with all possible means of transport. 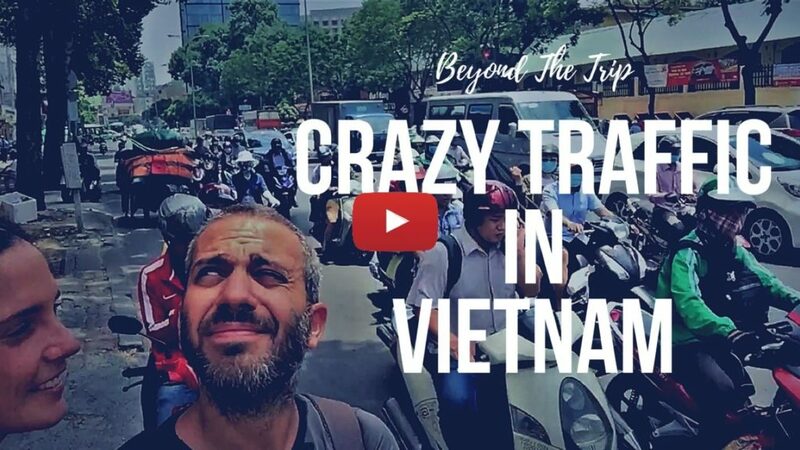 In this post we try to give advices to keep in mind to survive the crazy and unbridled Vietnamese traffic. Trucks are the undisputed kings of the road. They have such powerful horns and are so big they own the road. Everyone else must move. Second place goes to buses. They distinguish themselves from the previous ones because they are slightly smaller and because generally the noise of the horn sounds more like a funny song (reverse in particular! ). In third place cars. It does not matter the model, cylinder capacity or age of the car if there is one thing common to most Vietnamese motorists is the typical expression of an “old man behind the wheel” (not to be vulgar!) The driving is pretty lame. They put the arrow on the left but then turn right. They cut off the intersections, interlock in the streets in the oncoming lane. They look at the sky or scream on their cell phone while driving. I mean, they know they’re pretty lucky in their third place in the chain and they’re having fun. Fourth place goes to the mopeds that definitely deserve a separate paragraph (see below!). They are so many, without rules, carrying anything and going everywhere! The street code in vietnamdoesn’t exist. This paragraph could end here. It is enough to look at a crossroads in any Vietnamese city to realize that there is no rule. There’s no stop. There’s no such thing as a march. Traffic lights are just colored lights. Safety distances are measured in rice grains. In China people drive on the right. In Vietnam it doesn’t matter. They use it to transport food, animals, furniture (better than DHL!! ), tones of ice (!! ), mirrors, tubes, bricks. There is no limit to what you can load on two wheels… so even transport 4/5 people at once is not weird at all! 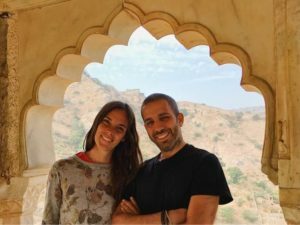 They can reach every location by motorbike: beaches, muddy streets, parks, mountains. I mean: where we, reasonably, would never go on two wheels, a Vietnamese would not see any obstacle. That’s why mopeds are also popular taxi. It’s the case of mototaxi GRAB that take you anywhere at any time of day, at low prices and also provide you with the helmet to wear. Another aspect that is important to bear in mind is numbers. More than the 50 % of the vietnamese population (90 milion people) own a moped. In this apocalyptic scenario, it seems impossible to walk around safetly in a Vietnamese city. Cross with locals: especially the first time you’ll cross a street in Vietnam, you’ll look for the help of some old lady. They have a lot of experience so important to imitate their pace, timing and attitude. 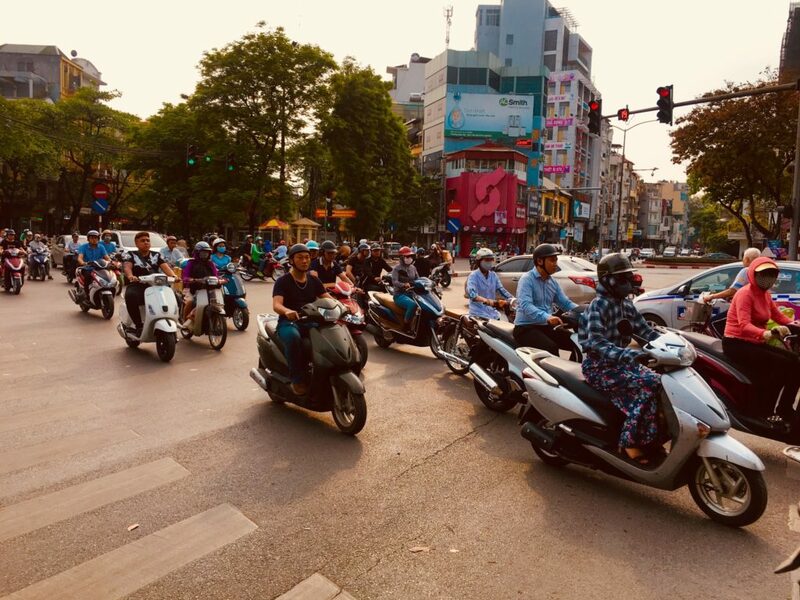 Walk calm and don’t stop: there is no street code but the rule “avoid the obstacle” is definitely the only thing they teach in Vietnamese driving schools (if they exist!) . While crossing remain calm and in control of the situation, yuo’ll see that scooters will be able to avoid you. The same can’t be said for cars and trucks. in this case, you will have to avoid them. Don’t forget the traffic chain (see above): always remember that pedestrian don’t count anything so eyes well open everywhere. 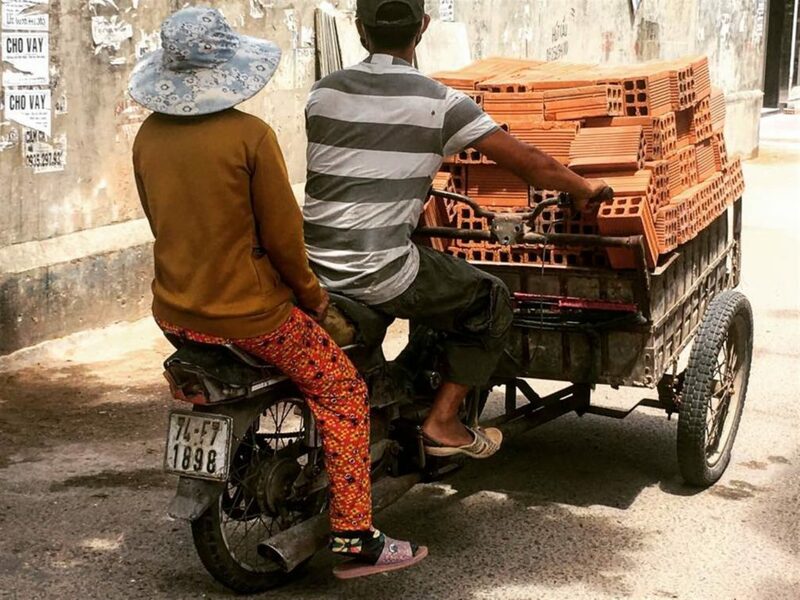 Because in Vietnam the platform is not only thought for pedestrians, itinerant vendors and cyclists. It is also the suitable space for scooters that want to avoid traffic jam or machines (especially taxi) loading people. The life of the pedestrians in Vietnam is not simple. But if you are careful and follow a few simple rules you’ll end up enjoying the crazy Vietnamese traffic!